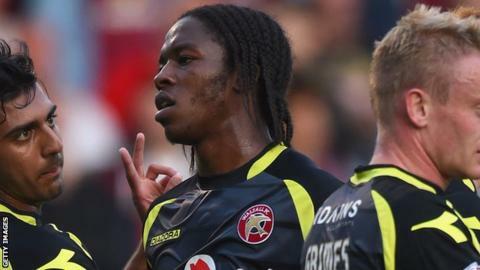 Romaine Sawyers scored the game's only goal as Walsall ended Fleetwood's nine-month unbeaten home run. Goalkeeper Richard O'Donnell tipped Martin Paterson's curling shot wide to prevent the hosts from taking the lead. Sawyers then took advantage of poor Fleetwood defending at the back post to smash a powerful, low shot past goalkeeper Chris Maxwell. Paterson nearly levelled but Paul Downing cleared off the line, with O'Donnell beaten, to secure the win. Match ends, Fleetwood Town 0, Walsall 1. Second Half ends, Fleetwood Town 0, Walsall 1. Attempt missed. Stephen Dobbie (Fleetwood Town) right footed shot from outside the box is close, but misses to the left. Corner, Fleetwood Town. Conceded by Paul Downing. Corner, Fleetwood Town. Conceded by Adam Chambers. Corner, Fleetwood Town. Conceded by Anthony Forde. Corner, Fleetwood Town. Conceded by James Chambers. James Chambers (Walsall) wins a free kick in the defensive half. Substitution, Walsall. Billy Clifford replaces James Baxendale. Attempt missed. Anthony Forde (Walsall) right footed shot from the left side of the box is close, but misses to the right. Corner, Fleetwood Town. Conceded by Richard O'Donnell. Attempt saved. Stephen Dobbie (Fleetwood Town) right footed shot from the right side of the box is saved in the top right corner. Substitution, Fleetwood Town. Nick Haughton replaces Mark Roberts. Attempt blocked. Martin Paterson (Fleetwood Town) right footed shot from more than 35 yards is blocked. Stephen Crainey (Fleetwood Town) wins a free kick on the left wing. Foul by Gareth Evans (Fleetwood Town). Stephen Dobbie (Fleetwood Town) wins a free kick in the attacking half. Attempt missed. Romaine Sawyers (Walsall) header from the centre of the box misses to the left. Hand ball by Stephen Dobbie (Fleetwood Town). Corner, Walsall. Conceded by Mark Roberts. Attempt missed. Stephen Dobbie (Fleetwood Town) left footed shot from the centre of the box is too high. Attempt missed. Jordan Cook (Walsall) header from very close range is just a bit too high following a set piece situation. Foul by Mark Roberts (Fleetwood Town). Attempt missed. Jeff Hughes (Fleetwood Town) right footed shot from outside the box is too high. Substitution, Fleetwood Town. Josh Morris replaces Steven Schumacher. Substitution, Fleetwood Town. Antoni Sarcevic replaces Tom Hitchcock. Stephen Dobbie (Fleetwood Town) wins a free kick on the right wing.